Bypass the long queues with priority access to one of the most renowned attractions in the world, the Colosseum, as well as the Roman Forum and Palatine Hill. With this combo, you will also get to experience the best of Rome, as you embark on a fascinating double-decker bus journey around the city. 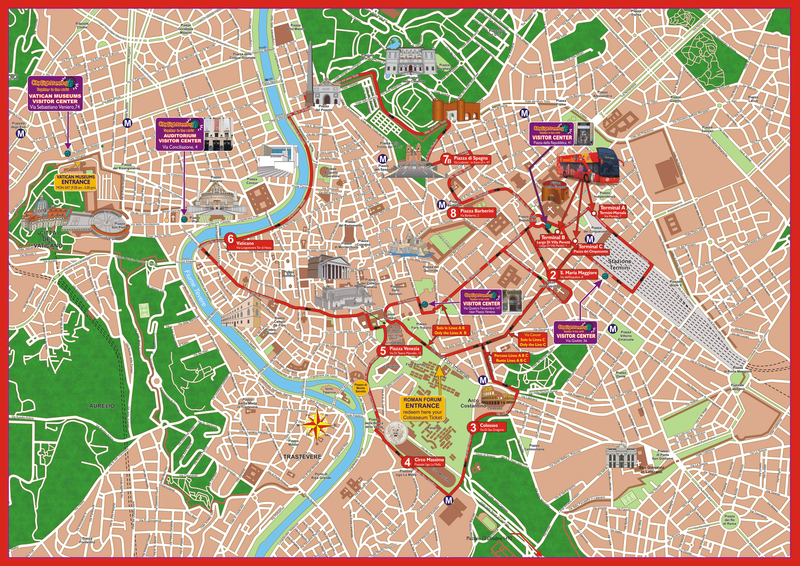 With the Hop-On Hop-Off tickets, you can use the Rome Sightseeing buses as many times as needed to visit the numerous attractions around Rome. Enjoy exclusive, fast-track, priority access to the Colosseum, Roman Forum and Palatine Hill, which are some of the most famous attractions in Rome. Explore the city of Rome with a 24-hour or 48-hour Hop-On Hop-Off bus tour, which gives you the opportunity to travel and experience the city on your own terms. Board double-decker buses from any of the 3 main stops on this route and easily redeem your e-ticket upon boarding. With priority access to the Roman Forum, Colosseum and Palatine Hill, you can go past the long queues that are a common sight at these attractions. First up, you will visit the most iconic attraction in Rome - the Colosseum. Seeing this massive stadium in the flesh is a whole other experience. The photos and videos don’t seem to do any justice to the feeling of being transported to a time when bloody battles and roaring crowds were a part of Roman culture. Next up, you can visit the Roman Forum and take a walk along the Via Sacra. The road was at one point the path for victory parades after the army came back from war. Finally, you will have a chance to visit Palatine Hill, the most famous of Rome’s seven hills, and get a stunning, panoramic view of the Roman Forum complex. Your tickets are valid for two whole days from the date of booking, giving you the flexibility to visit at a time of day that is best suited to you. Your Hop-On Hop-Off tickets let you board and get off at any of the stops on the route as often as you like! You will have the chance to explore each of the attractions on the route at your own pace and, with numerous bus stops present around town and buses departing every 10-15 minutes, you'll never have to wait too long. Conveniently explore major sightseeing attractions such as the Colosseum, Piazza di Spagna, Piazza Barberini, Piazza Venezia, Circo Massimo, and The Vatican. From the comfort of your seat atop the open deck bus, you’ll get endless panoramic views and photo ops of Rome’s top attractions. You can choose between a 24 and 48-hour ticket, depending on how much time you have and whichever pass suits your needs better. View a full map of the Bus Route and Visitor's Center here. Please note that, whether you pick the 24 or 48-hour variant, your ticket to the Colosseum will only be valid on the first day of your pass so you will only be able to gain skip the line entry on that first day. Colosseum & 24-hour bus tour - You can visit the city of Rome over a period of 24 hours using the Hop-On Hop-Off ticket. Colosseum & 48-hour bus tour –You can visit the city of Rome over a period of 48 hours using the Hop-On Hop-Off ticket. Large bags, backpacks, and suitcases are not allowed at the Colosseum. This tour involves a fair bit of walking so we recommend that you wear comfortable walking shoes. Open throughout the year except for 1st January, 25th December and the first Sunday of every month. You will receive an email confirmation with your Priority Access to the Colosseum & Sightseeing Hop-On Hop-Off Bus Tour ticket voucher shortly. Please take a printout. Show the printout with a valid photo ID onboard any of bus or at a visitor's center. You MUST carry valid ID with you to the Colosseum and present it at the time of entry if requested. Should you fail to do so, venue authorities may deny you entry and such instances are not liable for reschedules or refunds. The Colosseum, Roman Forum and Palatine Hill tickets are valid for 2 days. The Hop-On Hop-Off bus tickets are valid for 24 hours or 48 hours depending on the variant chosen.